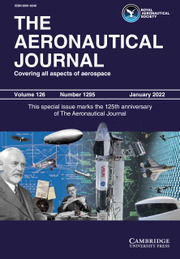 The Aeronautical Journal contains original papers on all aspects of research, design and development, construction and operation of aircraft and space vehicles. Papers are therefore solicited on all aspects of research, design and development, construction and operation of aircraft and space vehicles. Papers are also welcomed which review, comprehensively, the results of recent research developments in any of the above topics.